My wife and I are road tripping around the country with our dog. I am so tired of driving and ready to be back home, but that's another story for another time. Anyway, this week we find ourselves in Chicago. And what does Chicago have? White Castle! And what does White Castle have? Impossible Sliders! So let's talk about Impossible Burger! I've been wanting to try these for a while now. A hotel near our home in Miami sells them, and my wife has had one. But I didn't get the chance -- whenever I've tried to go, we end up eating somewhere else because the weather won't cooperate or because the place is too busy. 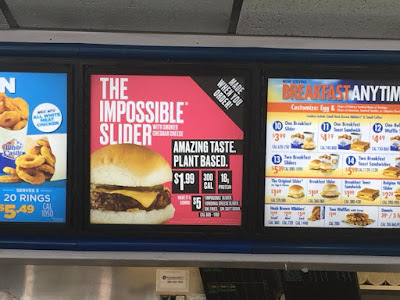 I stopped into the nearest White Castle and picked up a sack of Impossible Sliders yesterday and brought them home. With cheese (smoked cheddar) for me, without for my wife. Verdict: These things are good! They don't taste like White Castles -- you're not going to have horrible onion burps after. They sort of taste like meat. It's very close. I can taste the iron in it. It's almost a forward note flavor more so than in a real hamburger. Or maybe some people can taste that in a real hamburger and perhaps I just don't notice it. They look very much like meat. They look perhaps a bit more dry than your average hamburger patty. And the flavor verdict is: pretty darn good. It scratches the itch. It tastes less veggie than any other veggie burger I've had (and I've had many). We would definitely order these again. I believe the meat is actually sold loose or in blobs, like ground beef, and that it's up to restaurants to form them into patties. So that makes me want to try an Impossible Burger at a fancier sit down restaurant, to see if any difference in preparation makes for a difference in flavor. 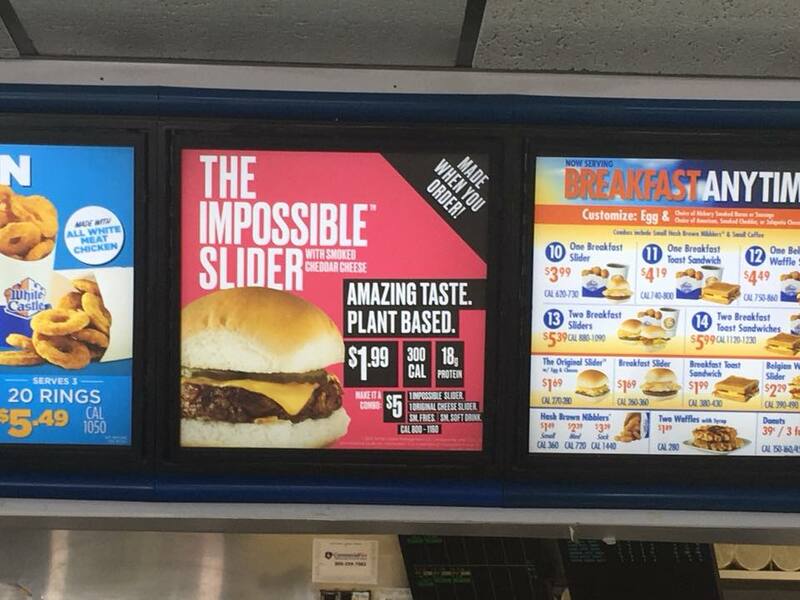 But if you're curious, and you want a try these out cheaply, White Castle is the way to go!